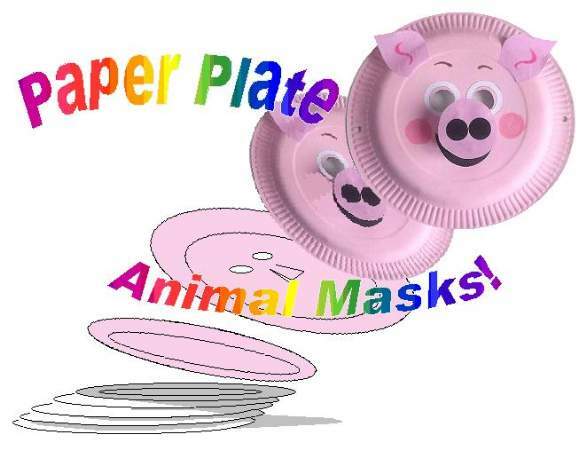 A Lion Mask or A Paper Plate? 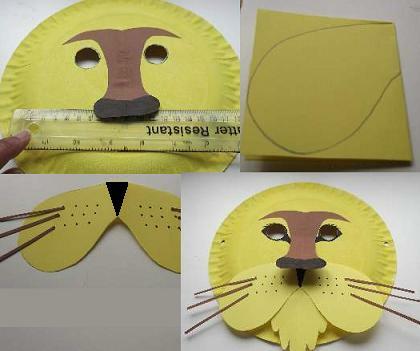 This popular paper plate lion mask is a teeny bit harder to make than the lion door tag but still is doable for kids 7 and older. The first step in making our paper plate King of the jungle is to paint the plate a background color. Lions are a golden color so I used a nice bright yellow. The colors our kids used are, eh... well let`s say interesting, and that`s ok if you don`t want to stick to any particular one. Be creative! Wait until it`s dry before the next step. To hurry up the drying process you can always blast it with your mum`s hairdryer, but don`t tell her I told you to do it! If you want to live dangerously, well let say, "the balls in your court!" Ok, now that it`s dry you can mark with a plus sign the spot where best to put the eyes to suit your face. If you face the light you can mark the spot where you see your finger`s shadow. Make a neat circle around the 2 marks. I used the inside of my sticky tape roll, but you can use a compass. To cut them out neatly score them with a sharp object and cut from the center to the circle edge. It then makes it easier to cut the circles out. do this with all your mask projects. 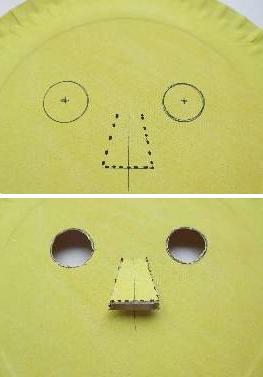 To make the nose, cut out a flap which you will stick the nose onto. 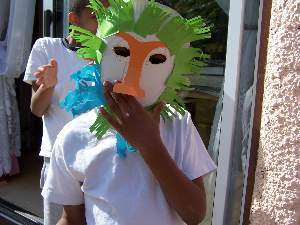 The flap is for your nose to poke through but it will be hidden under the nose of the lion mask. If you have a black marker pen or felt tip, color the end of the nose black for a nice lion effect. 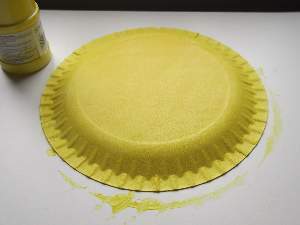 The next step is to stick it onto the paper plate, but paste the flap, not the nose. You can put some paste on the eyebrows to stick them down. Before you put anything else on the face, the beard has to be made and pasted in place. Cut a strip of yellow paper this time, or...pink? You can make it about 9 cm. Fold it in half and draw a half beard image on the fold. Cut and stick the end under the nose. Do not stick the nose onto it though. 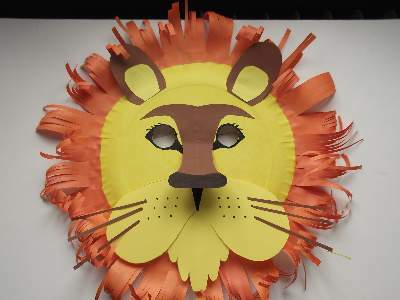 Like a real one our paper plate lion mask has chops with whiskers on! You create these the same way by drawing a half image on the fold. Make your paper 17 cm x 8.5 cm and it should be a square when you fold it. To draw it, start the line from the top right corner on the fold and balloon it outwards, downwards, and then inwards towards the bottom left corner. Turn it back upwards and outwards towards the top right corner but taper off further down the fold. See my image above to make sense of my instructions which can be a bit fuzzy sometimes. You can also darken around the eyes at this point. Lions look like they have make-up on. You need to stick the mane on before the ears. But before you stick the mane on you need to punch a hole at each side and tie a piece of thin or sheering elastic to wear the mask. So do that first! If you have orange paper or some other weird color if you prefer, cut a strip 7 cm wide. Cut slashes all the way along it making them 2/3 deep. 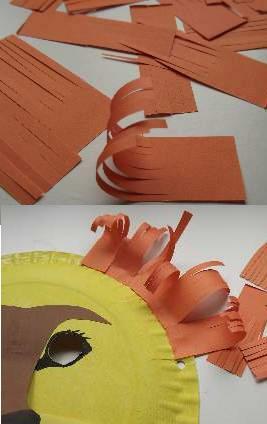 Now cut the strip into small pieces so that you can stick them around the lion mask. To make them curl like mine, just place them in between the edge of the table and your finger and pull them through. I stuck them curling both ways because it gives the lion a wild, shaggy look. Cut out brown oval shaped ears and smaller yellow oval inner ears. Cut off one end of the ovals to make a straight edge. 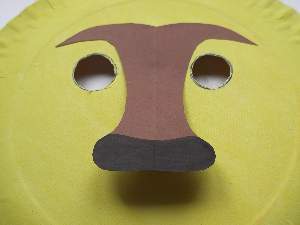 Stick the yellow pieces onto the brown aligning the straight edges, and then stick in place on your mask. Now you have an original KKC lion mask. This is James behind his mask. He likes the weird colors! 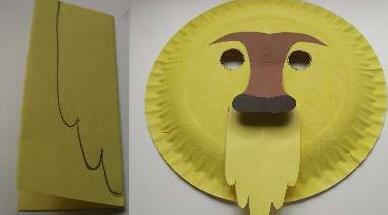 For younger ones, here is how to make our paper plate lion and turn it into a door tag if you like.